Tom Kamei, a structural engineer who devoted his professional acumen and volunteer efforts to preserving Little Tokyo, passed away on Aug. 23. He was 90. At the 2006 dedication of the Little Tokyo landmark, a bronze sculpture now installed in Toriumi Plaza, Kamei, a Kibei Nisei, articulated the reason why he was so passionate about Little Tokyo. Born on Terminal Island, Kamei was sent to Wakayama at the age of 12, spending the war years there. He received a B.S. in architectural engineering from Tokyo University in 1946 and upon returning to the U.S. in 1948, he enrolled at the University of Colorado and pursued graduate studies in advanced structural engineering. In 1950, he moved to Southern California and found employment in various architectural firms, first as a draftsman and later as a structural engineer for commercial and school buildings. Kamei’s structural engineering firm conducted a survey of all existing buildings in the redevelopment area in 1967, forming the basis for the creation of the Little Tokyo Redevelopment Project by the city. 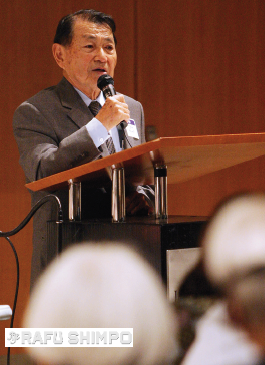 Yukio Karawatani, a retired planner with the Community Redevelopment Agency (CRA) and member of the Little Tokyo Historical Society, explained that Kamei’s firm found that many of the older buildings were not up to code, including earthquake standards. “Some were built in the 1800s and more than 80 percent were built prior to 1933, before the earthquake standards were created after the 1933 quake,” Kawaratani said. With CRA support, the masonry and stairwells were improved, and the historic buildings were reinforced for earthquakes. The north side of First Street, between Central Avenue and San Pedro Street, was designated a National Historic Landmark in June 1995. Kamei served as a structural engineer for many of the major buildings in Little Tokyo, including the Japanese American Cultural and Community Center, the Japanese American National Museum, Union Church, Higashi Honganji Temple, Centenary United Methodist Church, Sho-Tokyo Community Parking and DoubleTree by Hilton Downtown Los Angeles (formerly New Otani Hotel). Kamei would bring his expertise in earthquake resistance standards to other sites, volunteering to survey buildings after the Northridge earthquake in January 1994. A year later, after the Great Hanshin Earthquake struck Kobe on Jan. 17, 1995, Kamei traveled to Japan and volunteered, helping to inspect damaged buildings. 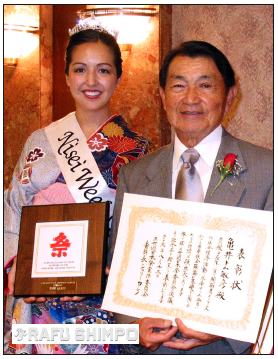 Mike Okamoto, an architect and 2014 Nisei Week festival chair, explained that Kamei’s meticulous, even-tempered nature was evident in both his engineering work and his interactions in the Japanese American community. Okamoto first met Kamei in 1981 when Kamei invited him to observe the mayor’s Little Tokyo advisory committee. At the time, different groups in Little Tokyo were engaged in heated debate on the development of Noguchi Plaza and the Ninomiya Kinjiro statue that is now at San Pedro and Second streets. “He taught me that there are differences in groups, even if they all look like one Japanese American group. Depending on background, there are differences. He wanted to make sure that I understood those differences, before I conclude that everyone is the same,” said Okamoto. Kamei also helped to train technical personnel from Japanese firms on local professional and business customs, acting as a conduit of information between U.S. and Japanese construction groups. “Many Japanese construction companies would work with him and he tried very hard to bring them into the community and learn the standards here. Many resisted because they wanted to go the Japanese way,” Okamoto explained. Kamei served as president of the Japanese Chamber of Commerce of Southern California and chair of the Little Tokyo Community Council. He also served as president of the Structural Engineers Association of Southern California. In 1995 he was awarded the Order of the Rising Sun with Gold and Silver Ray by the Japanese government. In recent years, Kamei spearheaded efforts to plant cherry trees along the streets of Little Tokyo. He was also a key figure in establishing the Oshogatsu New Year’s event in Weller Court. Okamoto pointed to the rooftop Japanese garden at the DoubleTree as an example of Kamei’s skill and a lasting tribute to the community leader. “A huge garden with a tree on top of the building — that’s a big challenge. A memorial service for Kamei will take place on Wednesday, Sept. 10, at 10 a.m. at Forest Lawn Church of the Recessional, 1712 S. Glendale Ave., Glendale. He is survived by his wife, Kay Kamei; sons, Jerry (Jill) and Duane (Gayle); grandchildren, Nicolas, Natalie, Evan, Jeffrey and Philip Kamei; also nieces, nephews and other relatives here and in Japan.